Here’s the (super long) summary for Episode 7! Tae-ik carried Man-ok out of the company and it actually caused a rumor to circulate around about Man-ok’s identity. Manager Hwang admitted that he was the one who activated the fire alarm to protect Tae-ik from the raging fans and LJ was furious about the news of Tae-ik possibly dating Man-ok. In order to cover the gay scandal of Kang-hwi that dragged Tae-ik along into the situation, LJ handed Tae-ik and Man-ok’s picture to a reporter to stir up a new story about TAKE ONE. Man-ok was hospitalized and she dreamed about the fire that killed her parents. Tae-ik was relieved when Man-ok regained consciousness but he started to nag about her actions earlier. Go-dong came to break another news to them; Man-ok was reported to had dated Tae-ik for a long time and she fainted because of stress about the recent scandal between Tae-ik and Kang-hwi. LJ acted like he didn’t have any idea about the picture and started to scold them. He suggested both of them to get engaged for three months for Tae-ik’s sake. 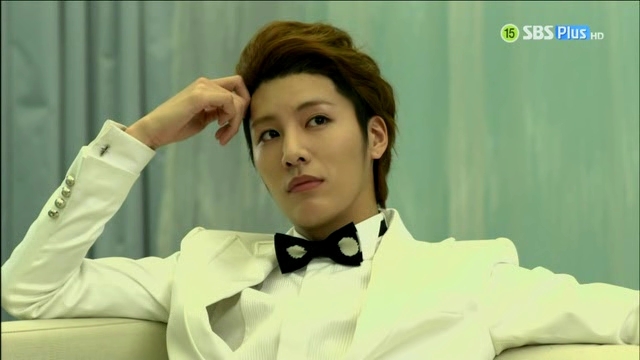 LJ told Tae-ik to follow his orders as long as he’s still under the contract for the Full House to be returned to him. Kang-hwi went out from the basement to satiate his hunger and he’s about to take some food from the fridge when he remembered Man-ok’s warning not to steal any of Tae-ik’s food. He told Man-ok to buy some hamburger for him, but she couldn’t go to the house on that day. Man-ok read the newspaper featuring the news about her relationship with Tae-ik and she’s pissed off with the absurd news, but she couldn’t forget what LJ said to her earlier. Go-dong thought that Man-ok was the only one who could save Tae-ik as the articles were already released and they couldn’t do anything to stop the rumor from spreading. Tae-ik went back to the hospital to have a talk with Man-ok. He’s supposed to ask for Man-ok’s help for the time being; however he ended up assuring her that he would take care of everything. Go-dong thought that Tae-ik should went back and tell Man-ok properly about his request. Man-ok was drinking her tea when someone entered the room. She thought it was Tae-ik, but that person turned out to be Manager Hwang. She was surprised to know that Tae-ik was her savior and because of that, Manager Hwang asked her to help Tae-ik. Tae-ik was busy thinking about the matter for the whole night while Kang-hwi wished that he’d go to sleep so that he could go out to the kitchen. Kang-hwi accidentally brought with him Tae-ik’s tablet and he checked the recent news, only to find out that Tae-ik was getting engaged. Man-ok got to know that her grandpa was going to stay away for another three months and she started thinking about the engagement. On the next day, Man-ok had to disguise herself in order to avoid the reporters hanging around the hospital. Manager Hwang sent Man-ok to the company, where Tae-ik was already there, getting ready for a photo shoot. He kept asking who’s going to be his partner and it’s no other than Man-ok. It turned out to be a couple shoot for them and they weren’t that happy to have that kind of surprise. Both Tae-ik and Man-ok went through the photo shoot with gritted teeth and fake smiles for the camera. Tae-ik and Man-ok started to argue about whose fault it was to cause the rumor as the ceremony was about to get started. Man-ok suggested that they both faked injuries to cancel the engagement, but it’s already started. They walked together into the hall, holding hands in front of the guests and the flashing cameras. Man-ok went back to her house and Ga-ryun went to ask her the truth about her engagement with Tae-ik. Ga-ryun felt betrayed as she didn’t tell her anything about it and thought Man-ok got engaged because she got pregnant. The fangirls started showing up at the Hapkido school and protested about the whole thing. She didn’t have any other choice and had to move into the Full House to protect herself. Tae-ik acted like he didn’t care about her moving in but he even went to check on her, but she already went to meet Kang-hwi. Kang-hwi thought that it’s strange for Tae-ik to allow someone entering his house just like that, but Tae-ik was the one who suggested for Man-ok to live in Full House after witnessing the fans’ behavior in front of her house. Tae-ik warned her not to do as she please in the house but things started to get worse for him: the sauna was a mess, his cream amount decreased and several bottles of juice went missing from the fridge. He accused that it was all her doing but it’s actually Kang-hwi’s. He did all that deliberately to piss him off. 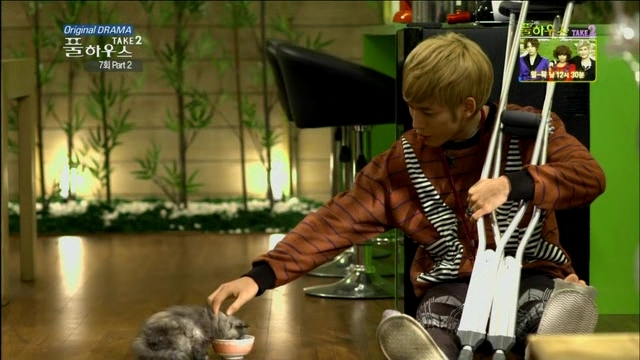 Kang-hwi felt stuffy to live in the basement alone and wished that he had a cat, so Man-ok went to buy him one. Tae-ik was close to find out about the cat but Man-ok managed to hide it. Tae-ik kept sneezing without any idea of what caused his allergy to show its symptoms. Kang-hwi was happy to get a cat and he won’t have to wander around the house as Tae-ik had installed CCTVs around the house. Tae-ik was mesmerized by Man-ok’s lips when she played in front of the CCTVs when she’s actually determining the blind spot of the cameras for Kang-hwi to move around secretly. So they did get engaged in the end and she even moved in because he felt it’s necessary for her to be protected from the crazy fans. Oh Tae-ik, you big ole softie! Why can’t you show your true self in front of Man-ok? His dorky reactions are just priceless. I’m still waiting for the day where Tae-ik won’t have to hide his true feelings for her and praying that he won’t be distracted by Se-ryung. I don’t want to hate Se-ryung too much but I didn’t have a good first impression on her. Acting snobbishly like someone who own the house and treating Man-ok like that isn’t going to get you inside my good book. Hopefully she won’t be that much of a spoiled brat and cause trouble for Man-ok and the two boys. I just want my dose of cute romance for my TaeMan couple and adorable bromance of TAKE ONE, so I pray for less hating on her. 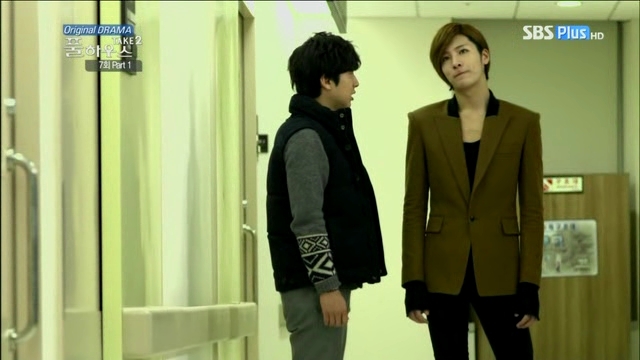 Wow, now I think I miss Tae-ik and Kang-hwi’s immature bickering…luckily kitty Kang-hwi is coming out of his ‘cave’! yay thanks for the recaps! I could totally watch this whole drama without Se-ryung, i know she just show up in this episode lol but i don’t think the story needed her that much. Anyway i think this episode was a bit slower but i guess this was a setup for the next episodes *i hope*. Also i thought that Kang-hwi would try to find the tape faster since he’s inside the house, i never saw him really trying but maybe that’s because of his injured foot. How many times Man Ok will lie to Tae Ik that she didn’t saw anything? lol. I love that TI seems to be liking her first too, if only he showed more affection instead of hiding it through his screaming at MO *sighs*. Hopefully Se-ryung won’t be too much of a nuisance..haha! Looks like we won’t see Kang-hwi creeping around anymore since Se-ryung will make him caught. more bromance! I need Tae-ik and Kang-hwi to join forces instead of having this silent war between them!